This picture of a monkey is on the short list of the best conservation photos of 2015, and we think it's beautiful. No, that's not the worst case of hemorrhoids you've ever seen. And no, it's also not a recreation of that rhino birth scene from "Ace Ventura: When Nature Calls." It's a photo of a real-life little monkey face peeking out into the world for the first time. 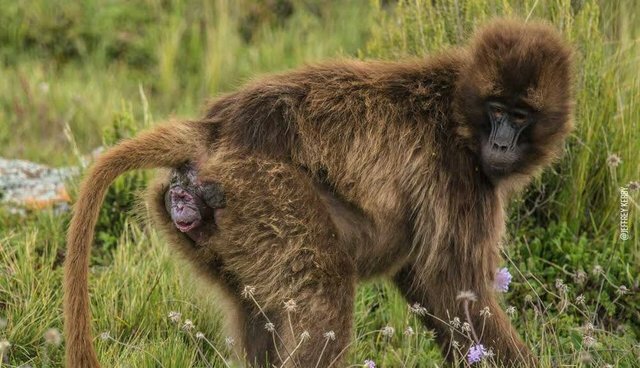 National Geographic photographer and Instagram curator Jeff Kerby captured this amazing photo of a mother gelada monkey as she turns over her shoulder to see her baby mid-birth. It's one of 25 photos that made it to the final round of Por El Planeta's 2015 photo competition. Kerby told The Dodo that his hands were shaking as he took the photo up in the mountains of Ethiopia. This is a unique conservation photo, he explained, because it shows, "life returning to a population and not being taken away." This year, Por El Planeta is awarding a total of $300,000 to various award winners across a range of interesting categories including: Animal Behavior, Our Changing Planet and Conservation Photographer of The Year. This gelada monkey mother-child pair didn't win the People's Choice Award, but we think the winner's photo is also pretty striking. Below are even more of our favorite photos from the competition's 2015 finalists. If you want to see all 25 finalists' photos, check out Por El Planeta's gallery.